Though your farm can do well with crops for the long run, hauling veggies out of the ground gets a bit boring after a while. You can liven up your production rather substantially by turning to the Carpenter’s Shop. Run by Robin and inhabited by her whole family, the Carpenter’s Shop is the place to go if you want another barnyard stable: farm animals. The Carpenter’s Shop is open from 9 to 5 on most days, though Robin will occasionally take a day off. I don’t know if it’s a set day every week, but Tuesdays seem to be off days quite often for me. Robin’s first service is that of a humble shopkeep. She has plenty of items for sale, including several that change regularly. 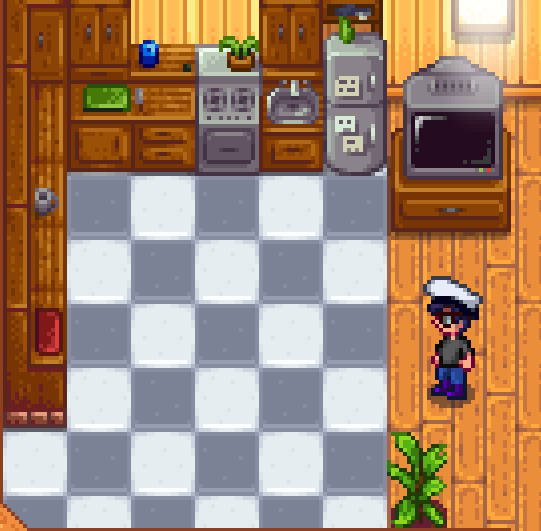 The meat and potatoes of Robin’s business is the construction of various farm buildings. Farm buildings provide a variety of services, but most are centred around the housing and maintenance of animals. Note that animals do not come with these buildings - you’ll have to breed them yourself, or purchase them from Marnie’s Ranch. 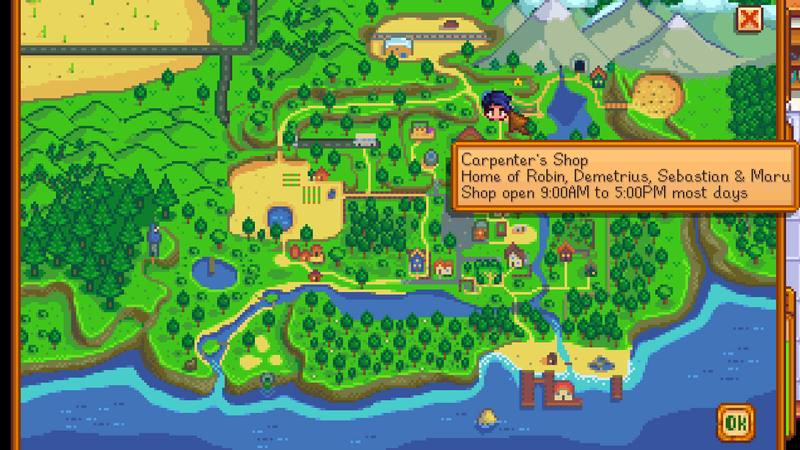 The construction of farm buildings takes roughly three days, during which time Robin will venture onto your farm and smacking away at her work site with her hammer. During this period you will not be able to purchase anything from her store, though you can still give her presents. Robin will not work on days she normally has off. It’s important to note that Coops and Barns come in multiple different versions. You can have as many of each version as you like on your farm, but you need to build the first iteration and work your way up via upgrades to subsequent, improved versions. Coops. Coops allow you to house and feed Chickens. Up to four Chickens can live in a single Coop. Coops cost 4,000 gold, 300 Wood, and 100 Stone. Big Coops. Largely identical to Coops, Big Coops come with Incubators installed, allowing you to hatch your own fowl, which now include Ducks. They can house up to eight Chickens. Big Coops cost 10,000 gold, 400 Wood, and 150 Stone. Deluxe Coops. The top-of-the-line Coop. Deluxe Coops can house twelve animals, now including Rabbits, and come with automatic feeding systems. Deluxe Coops cost 20,000 gold, 500 Wood, and 200 Stone. Barns. Barns allow you to house and feed Cows. Up to four Cows can live in a single Barn. Barns cost 6,000 gold, 350 Wood, and 150 Stone. Big Barns. One step up, Big Barns can house eight animals, now including Goats. You can now breed your animals, as well. Big Barns cost 12,000 gold, 450 Wood, and 200 Stone. Deluxe Barns. Premium grade installations, Deluxe Barns can house twelve animals, which now include Sheep and Pigs. Deluxe Barns can automatically feed your animals, as well. Deluxe Barns cost 25,000 gold, 550 Wood, and 300 Stone. Wells. A little watering hole. Wells allow you to refill your Watering Can. Wells cost 1,000 gold and 75 Stone. Silos. Storage spaces for cut Grass, Silos automatically dispense your feed to other buildings on your property. Silos cost 100 gold, 100 Stone, 10 Clay, and five Copper Bars. Stables. A home for your Horse, which you can use to quickly ride around Stardew Valley. Stables cost 10,000 gold, 100 Hardwood, and five Iron Bars. Slime Hutches. 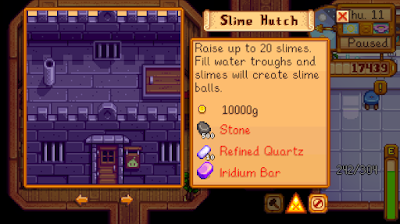 Ever wanted to raise Slimes? Now’s your chance. Slime Hutches allow you to house up to twenty Slimes at once. Slime Hutches cost 10,000 gold, 500 Stone, ten Refined Quartz, and one Iridium Bar. The first upgrade adds a kitchen, allowing you to cook food. It also substantially increases the size of your house, and allows you to get married. This upgrade costs 10,000 gold and 450 wood. The second upgrade adds several new rooms, including one that will allow you to have children. The upgrade costs 50,000 gold and 150 hardwood.